Everyone has moved before. We're moving back to PNG. We're used to this by now. It doesn't mean we don't have moments where we totally blank from time to time. 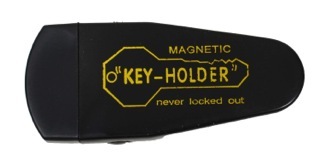 Because we have those moments, I tend to keep a spare key to our house somewhere outside, hidden, because… you never know when you're going to lock yourself out. My chosen spot to hide the key was our BBQ grill. I put it there months and months ago. We received the bbq grill from some friends who had one to spare, and they told us they didn't want it back. So I wheeled it out to the curb, slapped a "free, works great' sign on it, and waited. The neighbor seeing me do this said 'it won't get taken any time soon, this is a cul-de-sac. I told him 'thing disappear quickly in my experience, this will be gone before the night is over." 3 hours later I'm outside, leaving to pick up my daughter, it's 9:30pm. A woman I don't know comes up to me, and says "Is this BBQ for sale?" I chuckled because I was standing near the sign that read "FREE, WORKS GREAT!" and had responded with those exact words to her questions. She began to wheel it off to who knows where. She asked "why are you giving it away? did you buy a new one?" "no" I replied, "we're leaving." I didn't know the woman, and was wondering if she knew me.. why would a total stranger be upset. I watched as she wheeled it away in a general direction and got the idea she might be from nearby. Our earlier attempts this year to make friends with our neighbors were all meant with gruff attitudes so we never succeeded there. Today as I was thinking about returning the keys to our house, it dawned on me "uh oh, a total stranger has a key to my house and I don't know where they live!" In a total missionary mindset, instead of deciding to pay to replace all the locks, I simply decided to find the bbq. I took Calvin with me and we began knocking on doors in the general vacinity of where I guessed this woman might live. Door #1 - an older lady with a hose in her nose answered the door gruffly. I asked her if she had it, she said 'no' then asked about where I lived. Door #2 - a teenager girl answered, my son was with me to make me appear less threatening, and replied "oh yeah, it's out back." Within moments we had the key, no fuss no muss. Having planned parts of our return months and months ago, we made a reservation with a missionary house to spend the night on our way back to PNG. Since then, we were glad we booked early because every available room in the town was taken up by visitors attending a large sporting event. Last night we were informed, that there was a fire at the place we had booked. So now we can't rebook anywhere. We're praying that the place is repaired by the time we arrive. We have 5 weeks for them repair the issue and recover from smoke damage. That may or may not happen. Pray that it does because there is literally no other place we can sleep for the night. Either that or pray we don't need to sleep and can fly straight through. How many more MoD's will there be between now and then? We try to keep it limited as we plan the things we can plan, well ahead, and that allows us to flex when we need to flex.